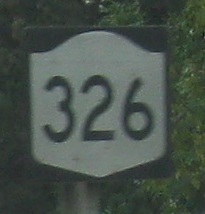 This and the shield atop the page are on the short Veterans Memorial Pkwy. 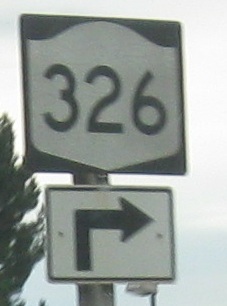 WB at the beginning of the route west of Auburn, leading down to the old alignment on Genesee St. that NY 326 then rejoins. EB (really facing north) on the Pkwy. back up from Genesee St. The BGS is original to when this was built in the 1970s, although originally, US 20/NY 5 were taken down this way onto Genesee St. and all three routes continued into Auburn that way just to avoid the congestion on Clark St. By just 1977, Clark St. was partially upgraded and partially bypassed by the new Arterial (North and South, WB and EB roadways), and 20/5 returned to that improved roadway. 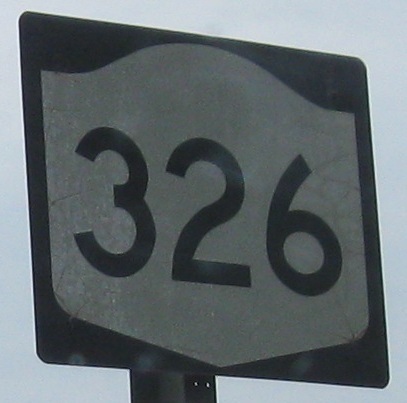 Now it was NY 326 that was routed up the Parkway, keeping it in the state highway system and bypassing the other old street into town. That's probably when these shields date to, barely newer than the BGS.